DC electricity is generated by wind or the sun. That is run through a charge controller which charges a battery bank. The battery bank is connected to an inverter which changes the DC current from the batteries into 120 volt AC current for the appliances in the cabin. The generator is wired directly into the inverter where the AC current is simply "passed through" to the cabin, but any excess power from the generator beyond what is needed by the cabin is converted to DC current and used to also charge the batteries. 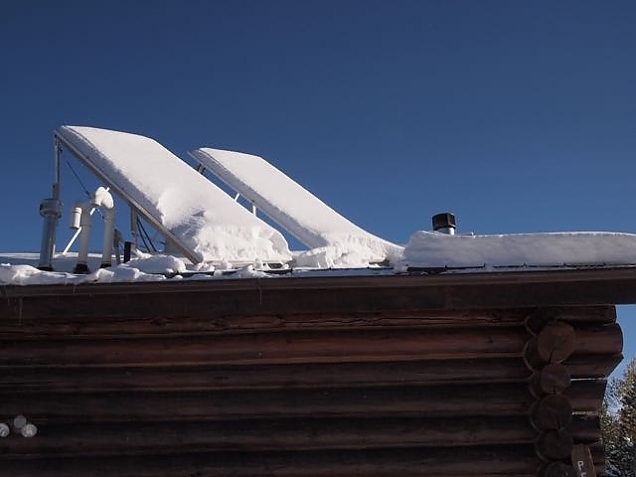 Existing PV panels on the roof of the cabin. Clearly, these don't provide electricity when covered with snow, so the snow must be brushed off after a storm. In designing an off-the-grid electrical system, the first question is "how much electricity do we need"? To determine this, we made a list of each electrical appliance we have in the cabin: lights in each room, the water pump, a vacuum cleaner, the radio, the TV and satellite decoder box, the satellite Internet modem, a toaster, the stove exhaust fan, chargers for a dust buster vacuum as well as cell phones, computers and iPads, the forced air heater fan, etc. (Our hot water, refrigerator and stove/oven run off propane). I've done this exercise for everything we use at the cabin and have estimated we consume about 6 KWH per day. (Although, I need to use the Kill-A-Watt meter to confirm some assumptions.) So, the batteries need to be able to provide this. And, they need to be able to provide it for several days in a row in case we have cloudy, still days and don't get any charging done! To the degree that electrical consumption can be reduced, that reduces the number of batteries required or lengthens the time we can go without charging. We've taken many actions to reduce electric use. Pumping water is one of the biggest drains on the batteries. So, we are conservative in our water use. We've put switches on many appliances so they don't have a phantom load when not in use, we've moved to LED light bulbs everywhere. These consume much, much less electricity than traditional incandescent light bulbs and even less than compact fluorescents (and, tend to be brighter). Let's talk batteries for a while. This shows our existing installation of 8 batteries--soon to be upgraded to 12 new batteries. 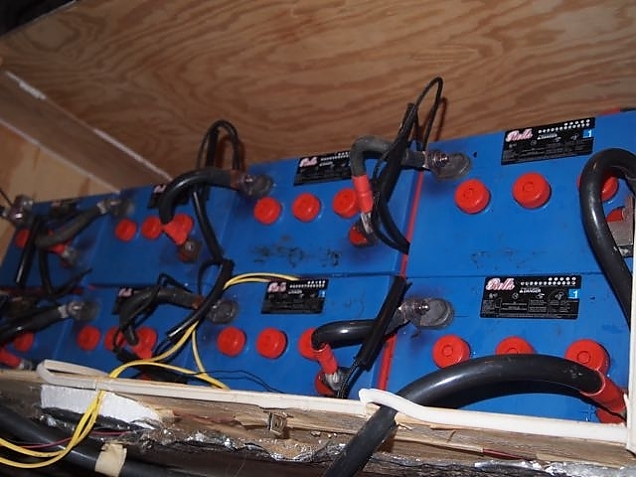 In this photo, you can see the two "banks" of four batteries, configured this way to give us a 24 volt system. The batteries are in a box with a lid so they can be sealed off. This helps them stay warmer and contains any gasses generated when charging the batteries. There are several types of batteries that can be used for off-the-grid applications. There are wet-cell "flooded" batteries similar to what you have in your car only built for deeper discharge at less current, and "sealed" batteries that do not require maintenance. Lithium Ion batteries, like you have in your cell phone or electric car, are also becoming available based on a recent announcement by Tesla. Each has advantages and disadvantages. I've chosen to stick to the basic flooded wet-cell battery and am upgrading my current (10 year old) batteries to a set of Trojan L16RE-B units. These are 6 volt batteries with 370 ampere-hour (AH) capacity (at the 20 hour discharge rate). It turns out that there is not a linear relationship between current draw and battery capacity. The capacity gets lower the more current you pull. So, battery manufacturers specify a capacity at a "20 hour discharge rate"--which is the current load required to discharge the battery over a 20 hour period--so that different batteries can be compared. This is also fairly representative of the typical real-world use of a battery in an off-the-grid system. My whole system is based on 24 volts DC, so the PV panels and wind turbine as well as battery voltage are sized for this. To get 24 VDC, I wire four batteries in series. Then, I wire three of those strings in parallel. This gives me a 24 VDC system with a rating of 1,110 AH using a total of 12 batteries. To calculate how much electricity storage this is in watt-hours, I simply multiply the 1,110 AH by the nominal battery voltage of 24.6 volts. That's a theoretical and maximum storage of about 27,300 watt-hours or 27.3 KWH. However, I'd never want to fully discharge the batteries. In fact, I don't want to ever use more than 70% of their capacity. So, we need to derate that to 19.1 KWH. Finally, there are inefficiencies in the batteries that come from operating them at temperatures different from the specified ideal, from changing the DC to AC, etc. So, let's derate them by another 13% to compensate for that. (According to the battery's data sheet, they have 90% available capacity at 60°F which is the average temperature of the crawl space where the batteries are stored. They'd have somewhat more capacity at higher temperatures. The other 3% is just inefficiency assumptions for conversion.) Finally, I think we can safely assume we have about 16.6 KWH of storage available. Since I've estimated I need 6 KWH per day, that is 2.75 days of "autonomy", meaning I could run the cabin at normal usage for just less than 3 days before I'd run out of electricity. (That's where the generator comes in handy!) I'd prefer three full days. But, if we know we are not getting any help from the sun and wind, we can conserve more, so this is not a bad setup. If I am going to take 6 KWH of power out of the batteries each day, it would be nice to be able to pump that, or even a bit more, into the batteries each day. For that, we rely on the sun and the wind. Let's talk wind first. Generating electricity from the wind is purely opportunistic. Even though the wind blows (a lot) at the cabin, I'd never want it to be my sole source of charge for the batteries. Instead, it is nice to have it "on top of" what I'll get from the sun. The wind turbine sits atop a 64' high tower behind the cabin. That gets it above the tree line and ensures it is not in the stream of turbulence caused by trees. When the wind speed goes above about 29 mph, the turbine "furls". This is a safety feature to prevent damage in high winds. The tail section is designed to push the turbine sideways to the wind, allowing it to slow the propeller rotation. This makes a noise like a helicopter landing on the roof of the cabin, and something we get used to over time. If the batteries are fully charged, reverse current is sent to the turbine by its charge controller that forces the blades to spin slowly, regardless of the wind. Well, up to a point anyway. Right now, the wind turbine is in a box in the living room and the tower is laying on the ground. Recommissioning the wind turbine is one of the tasks we need to tackle when we move into the cabin permanently. This photo was taken in the crawl space under the cabin. The box at the bottom is the battery box with the lid off. The bulge in the white PVC is a ventilation fan that comes on when the batteries are being charged. This vents any harmful hydrogen gas buildup outside the cabin. (Otherwise, "boom".) 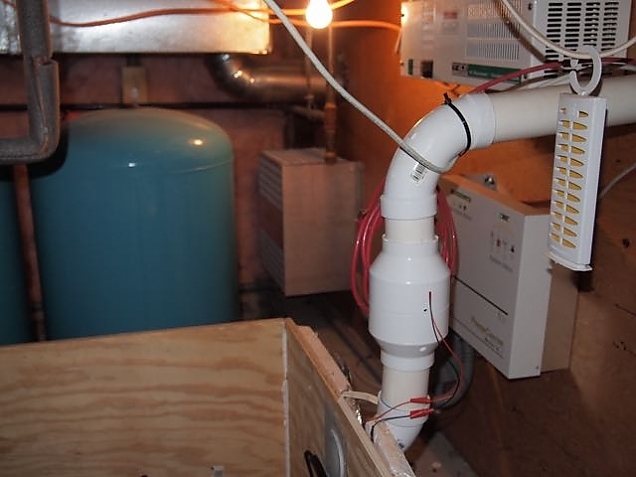 The blue tank is a water pressure tank. The box to the right of the vent fan is the wind turbine charge controller--it controls the charging of the batteries from the wind turbine only. Above that is a 120V to 240V transformer, since the water pump runs on 240V. In the far corner, right in the center of the photo is a "dump load". This is a box of huge resistors into which the wind turbine charge controller can dump current if the batteries are fully charged. That creates heat, but heat in the crawlspace is a good thing, especially if it warms the batteries some. Our main method of charging the batteries is with PV panels. We have a set of 8 PV panels mounted on the roof of the cabin. These are capable of providing about 100 watts each. They each can produce about 7 volts, so again we need to wire 4 of them in series to be compatible withour 24 volt battery system. So, there are two banks of 4 panels wired in parallel. If you do the math: 800 watts divided by a typical bulk charging voltage of 27.2 volts, we can get 29 amps of DC current for battery charging out of this system. Of course, that is only when they are pointed directly at the sun on a bright cloudless day. There is an online program called PVWATTS that can be used to estimate how much power you'll get from a specific PV setup at a specific location. Using this calculator, I see that I can get about 4 KWH of power each day in December and as much as 6 KWH in September from these panels. Cool. Remember, I estimated we'd need about 6 KWH per day. So, these panels alone will not provide the full charging capacity we need, especially in winter. They have worked fine for when the cabin was used for 2-3 days a week and as a vacation destination for a couple of weeks. The batteries had plenty of time to fully recharge after a few days of use. And, throw a little wind into the equation and we were "okay". But, living there full-time is another story. We'll need more PV. So, we are adding some. That means roughly 8 KWH to 12 KWH of charging power each day depending on the season. Now we have a bit of safety buffer and by being conservative in our power use on cloudy and still days, we should be able to easily recover to a full charge on bright sunny days--which we have a lot of. This brings us to our final source of power, a gasoline (or propane) powered generator. Today, we have a 4 KW Onan gas-powered generator wired into our system. That sounds impressive. After all, run that for an hour and a half and we'd generate all the power we use in a day! Well, the story is not quite that good. It turns out that the power output of a generator decreases with altitude. In fact, it decreases about 5% for every thousand feet above sea level. (Propane is even worse.) So, at 8650 feet, we only get about 56% of the rated power or about 2.2 KW. And, there are losses in the charging process, etc. So, we might get 2 KW of power from the generator. (I've only ever measured about 1.4 KW, not sure why.) Still, three hours of running the noisy thing should provide most of the electricity we need for a day. Until the new PV panels get installed, and before recommissioning the wind turbine, we typically run the generator in the morning for a half hour or so while we take showers and run the vacuum. Those are the greatest power hogs we have, so powering them from the generator means we take far less from the batteries each day. With the new PV panels in place and wind back in our favor, we'll only need the generator in those rare cases where we have not had sun or wind for several days in a row. And, we plan to replace the generator with a larger one. We have a 12 KW generator in New Jersey now. Maybe we'll use it. I hope this has give you a good overview of what it takes to live comfortably "off the grid" using the sun and wind to provide the electricity we need.